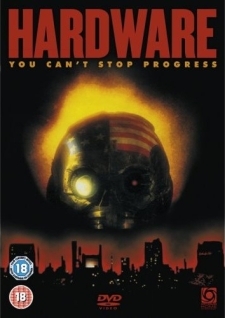 Hardware (1990) Film Review. Directed by Richard Stanley. Distributed by Palace Pictures UK, Miramax US. A great British debut film,an apocalyptic thriller set in the future,after a nuclear war. When a man gives his girlfiend,a salvaged head of an old war robot,thought to be long extinct. Being an artist she loves it. The problem is the robot is not extinct,and is reactivated,in her apartment,reassembling itself,using any electrical equipment,including power tools. And its basic instincts to kill,has the woman trapped in her apartment,fighting for her life. It is a very simple film,with great effects,from such a small budget. I do like films that are primarily set in one location,and this film is no exception. With great visuals,fantastic cinematography,that creates a very desolate world,with pastel colours of red,and orange. A fantastic debut from Richard Stanley,shame he never made a bigger name for himself,as he directed his second feature in 1992 called Dust Devil, that the critics loved,but the film sank without a trace, with his big screen debut of The Island Of Dr. Moreau,being replaced halfway through, byJohn Frankenheimer through creative differences on set. Shame as he had so much promise as a director,and has disappeared of the scene altogether now,As I said I loved this film,but only ever owning it on Vhs, I have today ordered the 25th anniversary edition on Bluray. So I very much look forward to watching it again. It is a very cool film,very post modern,well before its time,with a superb soundtrack also. Please if you haven't seen it please give it a go. A post modern aplocalyptic glimpse of the future,which truly needs to be seen.